What are maDMPs? What are they not? Who are they for? How are they different from “traditional” DMPs? What does this mean for the future of DMPs and support services? …What comes next? 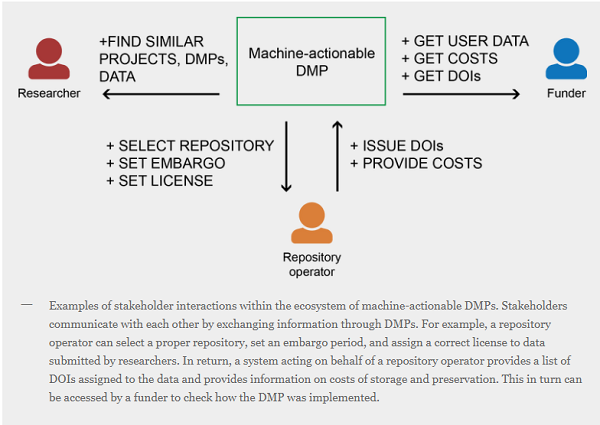 Machine-Actionable DMPs (maDMPs) are a vehicle for reporting on the intentions and outcomes of a research project that enable information exchange across relevant parties and systems. They contain an inventory of key information about a project and its outputs (not just data), with a change history that stakeholders can query for updated information about the project over its lifetime. The basic framework requires common data models for exchanging information, currently under development in the RDA DMP Common Standards WG, as well as a shared ecosystem of services that send notifications and act on behalf of humans. Other components of the vision include machine-actionable policies, persistent identifiers (PIDs) (e.g., ORCID iDs, funder IDs, forthcoming Org IDs, RRIDs for biomedical resources, protocols.io, IGSNs for geosamples, etc), and the removal of barriers for information sharing. Recorded ORCID Webinar : Enter once | Reuse often: What does this mean to research institutions?